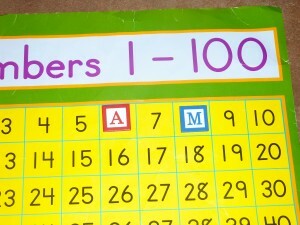 The other day was the “Hundredth Day of School” for Andrew and for those of you who don’t know about this, it is a big deal for young children. At the beginning of the school year they begin keeping track of how many days they have been in school. 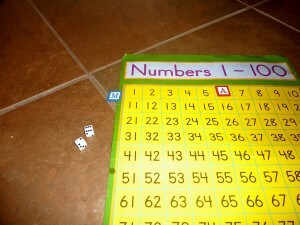 This allows for a very natural introduction and instruction about numbers. They usually use straws and add one per day until they have 10 to bundle into one group of 10. This continues each day allowing them to count by tens and adding on the ones. They celebrate when they’ve reached the 100th day of school because they get to bundle up 10 groups of 10 to make one group of 100. Very exciting for them!! 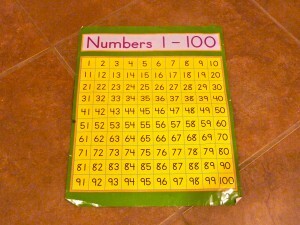 Children are usually encouraged to find 100 things and bring them to share with their class. This is also a great opportunity to work on grouping 100 items by 2’s, 5’s, and 10’s in particular. Last year Andrew brought in 100 colored puffs (He loves colored puffs almost as much as I do!) and this year he decided to bring in a 100’s chart poster. He found it in my supplies and squirreled it away to his room. 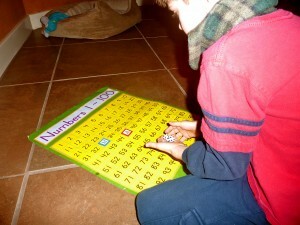 I purchased this chart in order to work on numbers with him by playing a game that is so simple it’s almost funny. 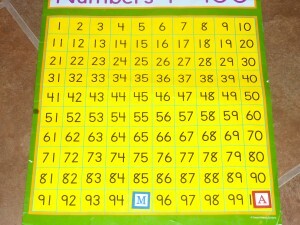 I did this game with my kindergarteners and it was a great way to work on number recognition, number order and adding on from a certain number. This could also be played in reverse to work on subtraction. 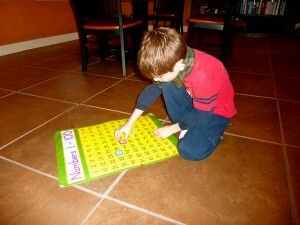 I thought it would be a great extension activity to reinforce at home what he is doing at school. 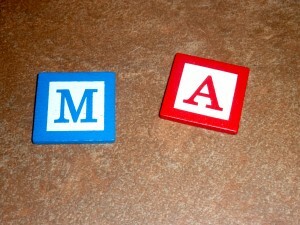 Our game pieces - these were letter tiles I found at Michael's. 1. 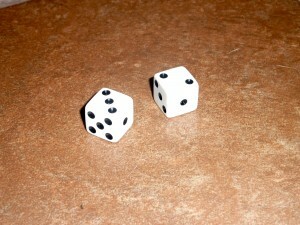 Start both game pieces before the number 1. 2. 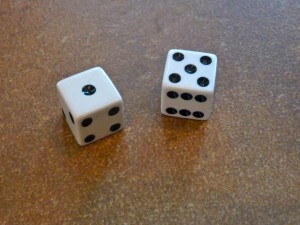 Take turns rolling the dice, counting and moving that many spaces. Andrew went first and rolled a 6. Andrew's game piece on 6. I rolled an 8. Game pieces after our first rolls. Say the number you land on to reinforce number and number name. Andrew taking his turn rolling the dice. Andrew moving his game piece. and moving until you get to 100! First one to 100 wins or if you play with Andrew, there are no winners because he gets just as excited to see everyone reach 100 as he is when he gets there. This is a fun way to work on turn taking while playing with numbers and learning if there are any numbers that stump your child. 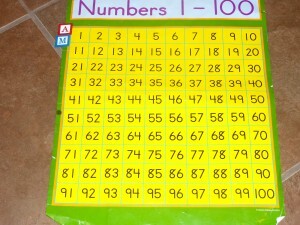 The more they are exposed to numbers through all modes of learning, visual (chart), auditory (hearing the numbers counted as they move through the chart) and kinesthetic (moving their place marker in order through the chart), the better their understanding will be of how numbers relate to one another. 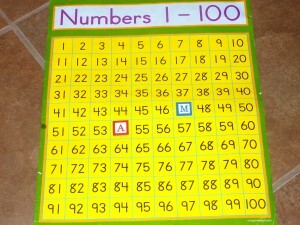 I have used this 100’s chart for other My Obstacle Course stations that I will share in future posts, but until then, Happy Belated 100th Day of School!